The first dance: will you high school shuffle, or have every single step choreographed? Do you take all 3 minutes for yourselves or do you invite the wedding party to join in? Will your guests be sitting or asked to surround the dance floor? Most couples either have these questions or have never even thought about it. The most important thing is to remember to go with what you are comfortable with (and discuss your plan with your photographer to make sure they capture the moment in the best way). If the first dance is something you have been waiting for, then just enjoy the moment. A chance to spin around the dance floor as husband and wife, even while all eyes are on you, can still be a very private moment for the newlyweds. If you plan on doing an extra twirl or maybe even a dip, make sure your photographer is aware of this. Bridal Party has the best view. Now for others, the first dance is something they dread. If you aren't comfortable dancing, and just feel as though you aren't going to enjoy it, consider inviting the bridal party to join in the dance. I've even had couples that have asked guests to join in. The best thing all couples can do is PRACTICE! Once a week or every other week dance to a song together. Now I don't suggest you dance to your wedding song every single time because you may end up being sick of the song, but the whole point is to make this process a bit easier. The best part of a first dance as a guest is seeing the couple really just enjoy the moment with ease. If you plan on choreographing your song, remember to pick a dance that is at your dance level or maybe one step above. It will all depend on how much time you have to set aside for learning a new dance. If you have a misstep it is important to remember just go with it. The point is to enjoy your dance, not cause yourself extra stress. 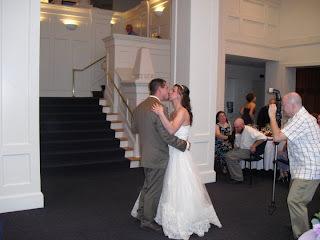 My personal favorite first dance for this wedding season (granted I have one more wedding for 2010) was Mr. & Mrs. Fettig. When they entered the dance floor, the entire room exploded with cheers and clapping. It was so loud that it caught me off guard. I would have sworn the room was filled with 300 people, not 100. I can't wait to get the professional photo of the event. This dance even beat out the couple that included their dog in the dance. 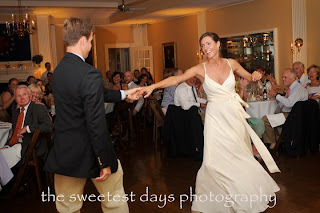 Thank you to 3 amazing Connecticut photographers, Sweetest Days Photography, Candace Jeffery Photography and Val McCormick Photography for sharing their favorite first dance moments. I know it was hard for them to pick just one!